I've added EES MIDI Kit Documentation to the site, with pictures and translation by Jesper Ödemark. It's funny - I see that this keyboard is now sitting at about 1500US, and has 9 bids on it (after only being listed for a day+). I am the owner of the Chroma on sale on eBay. I wanted to apologize for not putting a reference to www.rhodeschroma.com in my auction. My oversight has been fixed. Thank you and please feel free to contact me if you need any info on my Fender Chroma or are interested in purchasing it. Someone has a cassette tape of Walt Whitney's sounds for sale. Walt advertised his sounds on the site a number of years ago; I bought a copy but still haven't got around to loading them into my Chroma. They were all original; Walt wrote in 1999, "they are great patches, a good mix of useful stuff." Item 7314355374. Starting bid is US$5. Note that Walt Whitney since agreed to release his patches into the public domain; they are now available from the Patch Downloads page. perhaps whomever buys it could kindly load it in sysex to the site for everyone to try ?? I was going to do that, but as they were commercially available patches, didn't think it would be kosher. I'm not sure of Walt's status now, though, or whether he would be OK with having them freely distributed. Am not sure if the other bidder(s) are from the group, but I've put my bids in, we shall see what happens! If the bidding goes a little higher I can make up the difference to the bidder as long as they promise to share with everyone. Just let me know. I am in as well, I would love to see more patch sets posted on the site for download. Doh! Sorry Kevin, when I read "I am in as well" I thought you were bidding on the tape. My apologies. I will post the patches to the site if someone obtains the author's permission. No problem, won't bid again, good luck! Just to be clear, although I've tried to maintain the site as an "open" space and accept contributions with gratitude, I remain the only person who can make any additions or modifications. I've tried to be quite rigourous in obtaining permission to post articles and files. I've had Walt's tape for several years: I purchased it from him and he specifically asked me not to make the sounds freely available. That said, while I would hope that you would obtain permission to circulate the patches by other means--including this mailing list--I certainly can't or won't stop you (although I probably wouldn't include the file in the list archives). I suppose it's something of a grey area since you're buying it "no strings attached" from a third party, but as I was in touch with Walt about this I hope you'll understand my position. Perhaps I'll try to track him down again--or if someone else wants to, I'd appreciate it. Walt does not make mention of his Chroma patches here, but i have emailed him to see if its Ok or if he still out there. Thanks, Vincent. If Walt gives permission, the auction is moot--I have the tape and will convert the sounds for all. And I fully concur that Mr Ryan's great site should not be the type of place where members violate copyright laws or deprive talented programmers of their well deserved living...sorry for any misunderstanding. No problem. Perhaps there's some confusion between the site and the list. I "own" both: I do all work and maintenance on the site, and I'm mailing list administrator. Currently the list is hosted (free of charge!) at synthcom.com by Neil Bradley, though I'm the list owner. Perhaps some day I'll move it to rhodeschroma.com; I think my latest hosting company, to which I shifted when I created the domain in January, offers a mailing list as part of the deal. I have encountered only one copyright issue in the 6+ years the site has been up (a photographer objected to my inclusion of some of her photos from the Rise and Fall of ARP article, which I removed). As it generates no revenue, and costs me to host, I want to avoid any issues. Copyright last 75 years past the death of the author. Lennon's songs still make money for Mr Jackson. Knowing copyright and trademark law very well myself, that is only valid if the if the entity is still active. Were talking about sounds done over 20 years ago that are no longer for sale, by someone apparently no longer active in the music industry. so probably fallen in the public domain? Of course we are also talking about U.S. Copyright law... Which may or may not apply depending on where you are in the world. Not everyone in the world has the same opinions on IP as we uptight (IMO) Americans do. Although since the servers are in the U.S. it makes good sense that you follow U.S. law. Of course the bigger reason is what Chris has already stated which is we need to respect Walt and his wishes. Has anyone considered trying to "buy out" the rights to these patches if copyright is an issue here? I noticed Walt (who I have spoken with many years ago and remember him to be a very nice guy) is still selling patches for other synths @ $25 per set. If his patches really are that good and everyone wants them why not offer say $500 (whatever makes sense) to Walt to make the publicly available? We all know that the number of sales he could get is severely limited by the number of Chromas that exist. Take up a collection on the list to buy them and gift it to the Chroma user community. Of course we are also talking about U.S. Copyright law... Which may or may not apply depending on where you are in the world. Not everyone in the world has the same opinions on IP as we uptight (IMO) Americans do. Although since the servers are in the U.S. it makes good sense that you follow U.S. law. Actually, the servers are--as far as I know, anyway--right here in beautiful Vancouver, B.C., Canada (where we are slightly less uptight on IP but as I'm not a lawyer can't comment on this case). Great idea. If we hear back from Walt, perhaps we should suggest this. There are over 80 people on the list, so US$500 probably wouldn't be difficult to collect. When I started the site, I thought that patch sharing would be the biggest draw! There was a thread along these lines a couple of years ago, but David Clarke was the only contributor. I'll post any and all original patches sent to me. I'd be up for contributing towards the cost of the sound bank, if they are good, usable sounds. Did you manage to make use of patch file I sent you? If anyone can save it back out as a sysex file, please send it on and I'll post that as well. Thanks Paul--it's a nice sound. Folks, the original MIDI file had just a single patch contained in it. Attached is a SYSEX of that patch. This is set up so that if you download it, the sound goes into Program 0 (i.e., the current working patch). Following up to my earlier post - if there is anyone who can't use the syxex file but will wanted to try the patch - attached is a text-dump of the patch parameters (so they could be entered by hand). A - Cutoff Resonance (Param 38) 2 0 = Min Res., 7 = Max Res. A - Cutoff Tune (Param 39) 27 0 = Low Freq., 63 = High Freq. B - Cutoff Resonance (Param 38) 2 0 = Min Res., 7 = Max Res. B - Cutoff Tune (Param 39) 27 0 = Low Freq., 63 = High Freq. A very nice sound and great example of the type of thing the Chroma does really well!!! Anyone want to take a shot at expanding/correcting it? I just took a quick peek and while a bit brief, to me it didn't seem too bad. You're right; I was being too picky. It's not that bad, but there are a few questionable details (was it really an "ARP" Chroma? 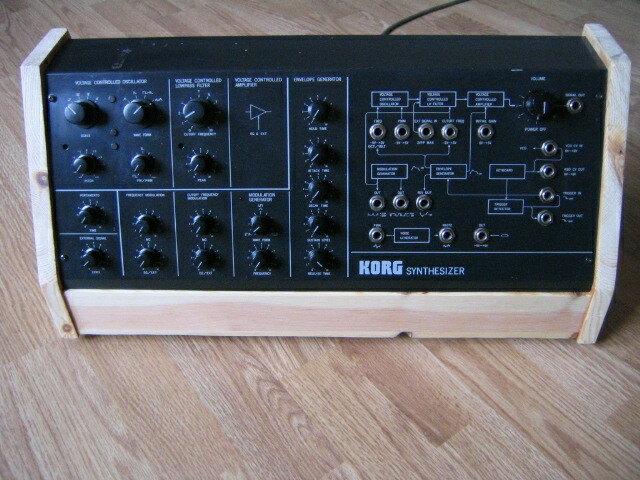 Did the DX-7 actually "copy" the panel design? Why was the Chroma actually discontinued? It seems to have sold reasonable well) and has an odd choice of link to the site. Maybe it's best if it just links to the site, but most Wikipedia articles are more comprehensive (this one is called a "stub"). The wikipedia article states that the Chroma had the first velocity/pressure sensitive keyboard. (or something similiar). The CS-80 obviously had it previously but does anyone know who had the first? On a non related subject I finally got my Chroma fixed. Since April of 2004 I've been working on getting the parts for the power supply upgrade. The guys at Cantos music in Canada did an amazing job. Decided I liked Don's lighter color scheme and told them to "follow their muse" and create something unique w/ the woodwork. (They sent pictures of the finished Chromato Chris w/ my permission to post)). I've added John Leimseider's notes and photo to the registry entry for Ron's Chroma . The light colour scheme really changes the appearance of the instrument! Damn beautiful result on the wood! See Chroma article (in Italian, of course). Given that it looked like the power supply needed to come out, it seemed like a good idea to embark on the detailed upgrade described by Martin Straw on the site. It wasn't hard or very expensive to get the parts together to replace all the transistors and upgrade the various resistors, etc. One thing I noted, but thought little of at the time, was that there was a fine coating of a white powder substance on parts of the board, more so on the bottom and towards the back panel. I cleaned the whole board off with alcohol and a toothbrush before starting. I started replacing components from the inside of the board, just easier to get at them there and this started smoothly. Unfortunately, the real bad news is that as I progressed I found traces lifting off the board and easily broken. Over near the power transistors, I found I could lift traces from the board with my fingernail. This was not going to be a reliable upgrade. I'm now guessing that the white powder I'd found was something chemically leached from the board in response to 22+ years of heat. Abandoning Plan A, Plan B looks like Don Tillman's plans for replacing the whole power supply with a new one off the shelf, "Nuclear-powered Chroma". The Power-One supply he used is still available. No trouble constructing a small perf-board with the power fail signal buffer and outboard analog 5V supply. No trouble constructing the power supply to Molex plug adaptor harness. I put together a dummy resistor load so I could check (and double and triple check) all the output voltages. Following Martin Shaw's direction, I adjusted my +12 supply to precisely match the -12 supply which is not adjustable on the new supply. They're now +/-11.85V. I also elected to make my new 5V analog supply adjustable and set it to 5.05V per the service manual. Tried power again after connecting that ground wire. Still all errors on start up, but no smoke. Listening to the failed channels, I can hear vague resemblances to what the patches ought to be. The oscillators are running. I can open and close the filters and amps, at least partly. But the tuning is a mess and each voice seems never to silence, but drones on in the background. So, the DAC is now probably far from linear? A replacement DAC is readily available. About $12 from Digikey. It comes a few days later. The old one is even socketed so the I/O board does not even have to come out. Now I get the flashing lights during power up autotune and NO ERRORS! Yes! The output sounds fine and everything seems to be working. I retest and retweak all the power supply voltages. I think it seems smart to test the digital +5 all the way out on the end of the memory chips on the CPU board and adjust for 5.00V there or about 5.1V back at the supply. I noted the outboard regulator for the 5V analog supply gets quickly too hot to touch so I put a standalone heatsink on that. One last thing is to connect my Syntech MIDI interface and recheck the supply voltages. Again good advice from Martin Straw. But what happens when I power the Chroma up the Syntech attached is lockup as soon as autotune is complete. Pull it off and now OK. Plug it back in and locked up again. Hmmm... This seems vaguely familiar to me. What I rediscover is that for some reason, at least the combo of my Chroma and my Syntech interface like the 5V digital supply to be low. It starts to work around 5.02V, but as things heat up over the first couple of hours this point droops. I've left it set at 4.97V measured at the supply. That was now more that two weeks ago and I've used the Chroma most days. On a couple of occasions I left it running for 12+ hours straight to no ill effects. Heat does still build up, but nothing like the old supply. Though there's not room to bolt the new supply to the back panel, I am going to look at getting a piece of aluminum stock to bolt in between. As Don points out in his article, the Chroma is a little lighter and better balanced, so easier to handle. Don also noted an acoustic buzzing with his original supply. Mine did this too. Seems to me now this is inherent in the pre-regulator loading and unloading the transformer at 120Hz. [Does everybody's Chroma buzz?] The new supply is dead silent. Now I notice a tiny whine from the display backlight on my Wavestation A/D sitting atop the Chroma. Never heard that before. I don't miss the burning transformer smell either. My thanks to Martin and Don for all their advance work. Now back to music. Well, one last warning I had to ignore. The docs with the Power-One supply clearly state, "Power-One products are not authorized for use as critical components in nuclear control systems without the express written consent of the divisional President of Power-One, Inc."
So glad Matthias Becker had the PSU changed on mine before selling it! Can you please tell what MOLEX connectors you found to mate with the CHROMA power connectors ?? So many look a like in the catalogs I am not sure what part numbers to use for this. And, what a bout a cooling fan ?? This could alleve some of the heat build up with an exhause fan to pull hot air out of the box. Some new fans a re very quiet, too. I got my Molex conectors from Mouser. (Fast, cheap shipping, no min order. Lots of data sheets online. http://mouser.com) Their stock numbers are listed. For connection to the Power-One MAP-80 power supply Don used tiny spade lugs. These supplies also have the facility for (yet more) Molex connectors. The upside of the spade lugs is that you can make mutiple connections easily, as for the grounds. The down side is if the supply ever needs to come out you'll need to go through the process of making sure everything is properly connected all over. I elected to use the Molex connectors and a couple of wire nuts for multiple connections. Re: Heat and fans. Many years ago when stories about Chromas and heat started going around I attached a heat sink to the back panel of mine. I sanded off all the paint from the clear area, cut a heat sink from an old stereo to fit and bolted it on with heat sink grease. With the original supply, this got hot enough that it was uncomfortable to touch which tells me it was working. I did experiment with external boxer fans, but though these cooled the heat sink, all were audible. Given I now have a silent power supply, I hope I can get by without a fan. The frame of the Power One supply is its heat sink. I'm hopeful that a thermal connection to the back panel (and my heat sink) will be a final solution. Jim has really done his homework on these connectors. I think this is valuable information to anyone with a power supply problem. Is there somewhere on the website to archive these molex part numbers? The message will be included in the list archives. But perhaps there is some value in putting together a page with this sort of repair information. Or it could be included as an addendum to Martin Straw's Diagnosis & Repair article. Any other ideas? I am a former chroma owner interested ner and have a couple of spare parts that I would like to sell. If you have anyone interested, I have a couple of boards that I would like to sell for $150.00 each US Dollars. Our Chroma knocker when moving the parameter slider is developing a mind of its own and pounding out some bad rythms : ) Is this a easy fix and part to replace/find ? Has anyone ever disconnected the Chroma EQ to see if this might lower the noise floor slightly? I disconnected the knocker altogether.Its placement was creating a clacking sound when the keys below it were struck.More than likely the aligment of the rail inside got moved slightly as I'm getting stuck notes in the lower half of the registry requiring me to open her up and rebend the metal contacts.Anybody else have this problem? That could very well be it. My slider it bent and slight off kilter. It's gotten a few sprays of Caig Calilube and is much smoother since coming out of storage. The knocker noises and edit parameter glitches go away after about 20 minutes of warmup now. Is replacing the the edit slider a easy job ? Does anyone have the part I would need that I could buy affordably? While it is always possible that the tapper itself could be ill - I tend to agree that the more common source of tapper problems often lie elsewhere. Following on to the note above, a good item to check is whether or not the decimal point ("program modified" bit) in the display indicates that a change has occurred. If it does, then the Chroma does think that something in the patch changed (and so it dutifully tapped the panel for you). If you can find out (and fix) the reason for the unexpectedly changing value (e.g., a panel button getting weak and asserting itself - or the slider issues noted above), then the tapper craziness should also go away. If you don't see a panel change, but the tapper is still tapping (esp. if the set-split command to turn the tapper off doesn't help) then you might want to take a peek at the electronics controlling the operation (ref: Service Manual p #6-5, the i/o board schematic). The tapper is controlled through a 74LS74 flip flop, a cap or two and a transistor. I've also seen cases where the transistor (and/or some of those other components) have gotten sick - causing funny tapper behaviour. For me, the outputs are quite quiet; however, a quick check to see if the EQ might be adding noise would be to use one of the mono outputs in the "audio inputs/outputs" section on the back panel (as opposed to the main mono out). If you hear extra noise when using the main mono out but don't hear it when hooked up to the other outputs - then it may be the EQ (since the EQ only affects the main mono and balanced outs - not the invidual in/out 0/1/2/3 ports). If you hear noise on all the ports, then it would be matter of tracing back to see where the circuit its coming from. One quick test would be to disconnect the audio inputs to the EQ board. If the noise goes away, then the noise source is somewhere back towards the voice cards. If the noise remains (without any audio input), then perhaps there's something going on with the op-amps/CEM3360 on the volume/EQ board. and yes the edit dot does come on when all this is happening. This happened to me years ago. That the display is jittering means the AD converter thinks the value it's seeing is changing. Check the two screws on top of the big capacitor in the power supply. If they're not tight the outputs will not be totally stable. The AD converter's reference voltage seems to be the most sensitive part of the Chroma to this. When the power supply heats up the metal expands and the connection gets better. The screws will gradually get looser. While you're at it, verify the terminals on the little circuit board on top of the capacitor are mounted underneath it, as the service manual recommends. Be aware that there can be a charge on those terminals even after the Chroma is off. If you don't know how to measure or discharge the cap, best to wait a while after the Chroma is off.